Being from Colorado, I wanted to take full advantage of the seafood that San Francisco had to offer. I decided that everything that I would order would be seafood. 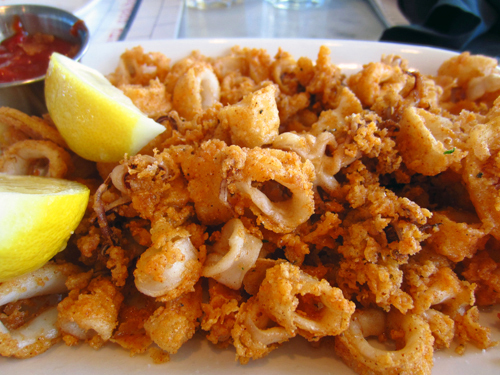 We started off with fried calamari; I have never been much of a calamari fan, but the others were pretty happy about it. Next we had the most amazing crab fondue. 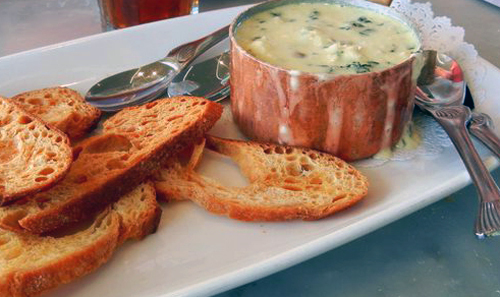 It was a cheesy dip with huge chunks of crab. We ended up needing more crostinis to finish it! We also had two types of crostinis. 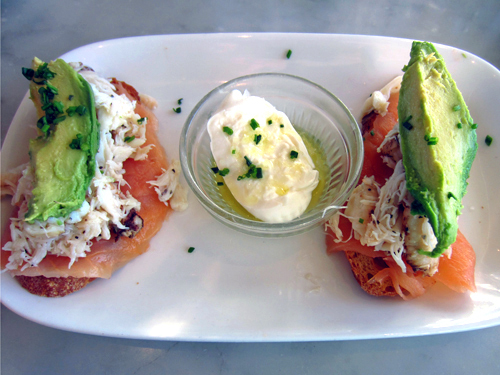 The first was a smoked salmon, crab and avocado crostini; it was my favorite of the two. 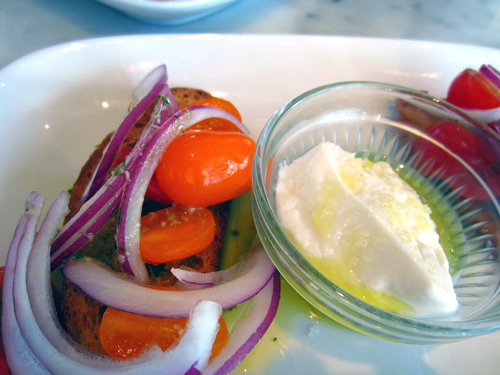 The other was a tomato and onion crostini, which my mom loved. Both appetizers came with burratta cheese, whith my mom was also very happy about. This weekend was my first time having burratta cheese and I ended up having it at two meals. 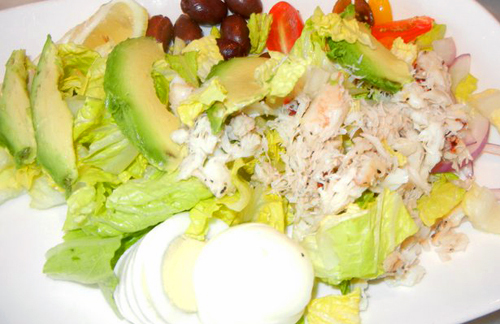 Next, my friends and I split the Crab Loui salad. More crab? Yes please! After our appetizers and salads, my two friends and I decided to each order something different to split. First, we ordered the crab enchiladas. 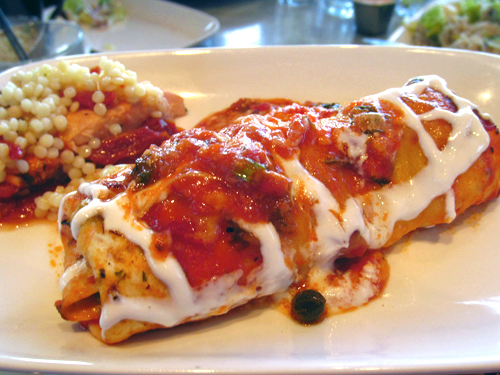 They were very unique, I had never have a seafood enchilada other than shrimp. They had just the right amount of spice with a bit of sour cream. The menu also had an option of picking a fish and then picking a way to cook it. We ordered salmon tomato conserva as one dish. 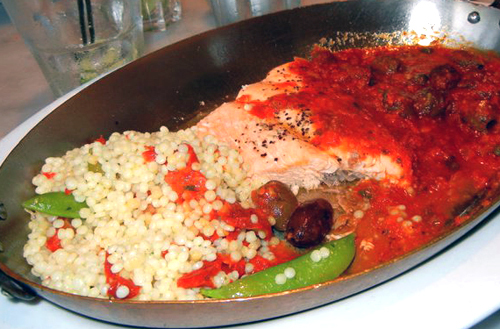 It was salmon baked with a rich tomato and olive sauce. 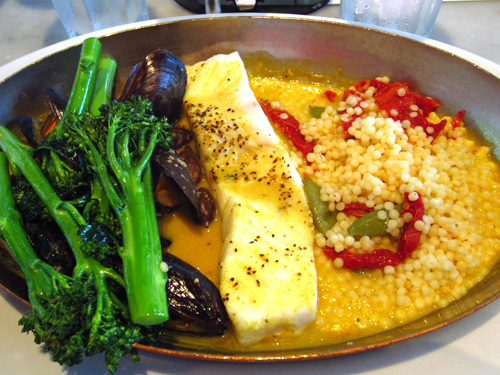 We also ordered the sea bass in a mild curry Thai broth with a side of mussels. Everything was delicious and I got my share of crab and fish in for the night. 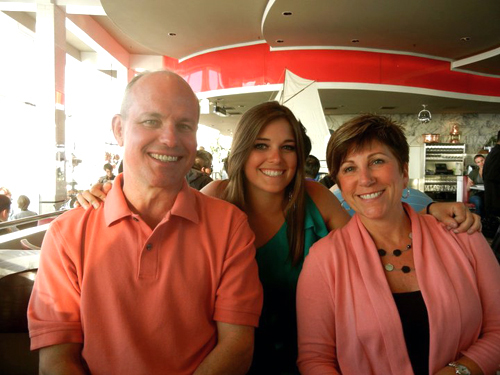 I think my favorite things were the crab fondue and the crab enchiladas. 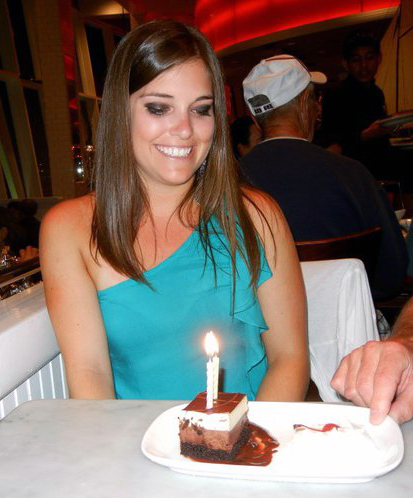 And of course it wouldn’t be a birthday weekend without another birthday dessert. This dessert was a chocolate cake topped with chocolate and vanilla mousse… yummm! If you ever stop through San Francisco, you have to go to the restaurant for the delicious crab options and the beautiful views. I would love to go back to this place! Oooh those crostinis and that dip look amazing! All that crab sound delish- Happy belated BDAY! I second that those crostinis look fantastic. Happy birthday!